Vinyl, tape, CD: relics from a time that was simple, well-arranged, tangible, and dominated by record labels. 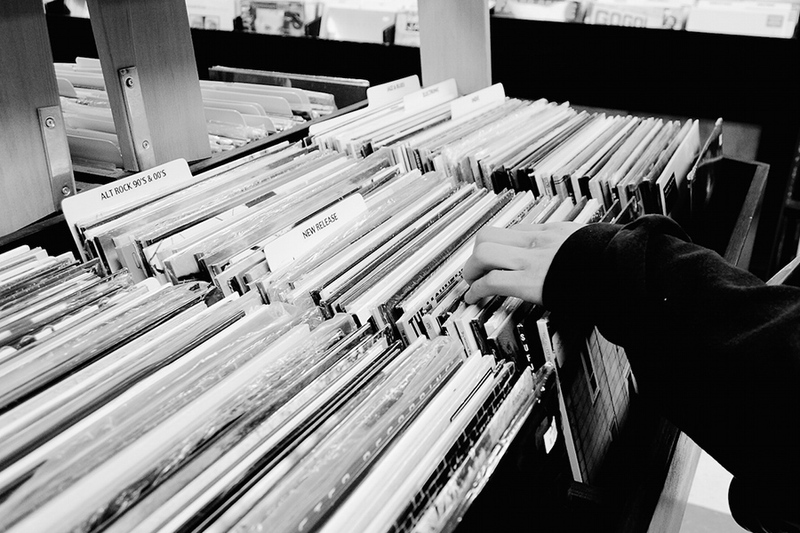 Since 2008, we celebrate this almost-ancient world with Record Store Day. This year on April 13. A long time ago in a galaxy far far away, people picked a musical genre and styled themselves accordingly. Power was divided among a small, select group of rulers. Only they had access to the magical technologies of mechanical reproduction. The knowledge and power to immortalize artists on pieces of vinyl, magnetic tape or plastic discs. These rulers decided who had the right to be a part of this world, and who was eligible for entering the stage of eternal fame. Artists didn’t know better, and fans followed one or two acts religiously throughout their life time. But, the balance was about to be disrupted. Legend has it that two shaman-like figures called Shawn Fanning and Sean Parker, from the parallel universe of computer science, opened the gates to their dimension. They lounged Napster, software that people could use to download music for free. When everyone thought the whole world was going to collapse during Y2K, the only thing that trembled were the foundations of the music industry. The new dimension is the post-Napster world. A universe where every user can choose for themselves which part of an album will blast through their speakers – without paying the full price. Better yet: without paying at all, because in this world music was free. As a result of these developments, record labels – and the musicians they represent – lost part of their power. More importantly: part of their revenue. So, they decided to go head to head with this new form of piracy. The most famous opponents of Napster, that tried again and again to make a case against the music-sharing platform, are the members of Metallica. These trash metal heads lead the witch hunt on copyright infringement. Sadly for them, there is a famous precedent in the case of Sony versus Universal, better known as “The Betamax case,” from 1984. Wherein the same principles and arguments are under discussion; technologies that enable automated reproduction, and copyright infringement. Sony’s Betamax technology lets consumers record something from the television, which leads Universal City Studios to sue Sony. In the end, the judge decides that Sony is only responsible for the invention of the technology and that its appropriation by the consumer is out of their hands. Moreover, the recording of TV shows is labelled “fair use.” The same goes for Napster’s case: the technology doesn’t breach any laws, the users do. Progress and innovation go hand in hand with struggles. The status quo is not easily disturbed. Lawyers begin digging through the communication between Napster’s founders, Parker and Fanning. Until they find a smoking gun: an e-mail wherein the two confirm that they know their technology breaches the law and that they have consciously and purposefully created it that way. The “Betamax case” protects the developer against the misuse of their technology by others. But when it is proven that this misuse was actually intended, then you’re consciously breaching the law. In 2004 Napster goes offline, but its technology has changed the world into one of payed online streaming services. Most stories have two sides. In this case there are people that stand behind the “old order,” but also those that feel more for a new division of power. Good or bad? Maybe it’s not about that. Maybe it’s more about innovation and the way an established system deals with that. Surely, technologies like Betamax, Napster and others alike changed the music industry. On the one hand, it has given artists the power to produce and release their work independently of labels. On the other hand, the competition has grown, which makes the work of an artist harder. The music business is gradually finding a new balance. A new status quo in which artists have the freedom to choose. Do they create a number of tracks they call an album or EP and publish them on a streaming service? Or do they follow the old ways and release a record with beautiful artwork that needs a different kind of hardware than a smartphone or laptop. No matter which way they go, a record is still called a record. So let’s honor it next Saturday. Check out our channel where you can play along with songs from the 20 best records of all time, according to Pitchfork. Happy jamming! This entry was posted in Events, News on Saturday April 13th, 2019 by Teo Lazarov.